Woven in the 1920s, this antique carpet features a stark field enhanced with geometric borders that embody the sensibilities of the Arts and Crafts Movement. Vintage Art Deco Rug, Country of Origin: Europe / France, Circa Date: Early 20th Century – This beautiful Art Deco vintage rug from France includes strong geometric lines woven in a handsome combination of forest green, celadon, ivory and muted apricot pink. Compartmental borders featuring a series of geometric divisions provide a formal frame for the outside of the carpet while symmetric checkerboards and forest green cruciform motifs surrounded by a series of stepped cartouches round out the inner borders and provide a dominant design element for this understated and exceptionally handsome Art Deco runner rug from France. Reminiscent of the simple geometric lines used by Arts and Crafts designers and followers of the Craftsman Style, this unique vintage French Art Deco runner rug evokes the elegance of Tiffany, Stickley and most successful designers of the time. 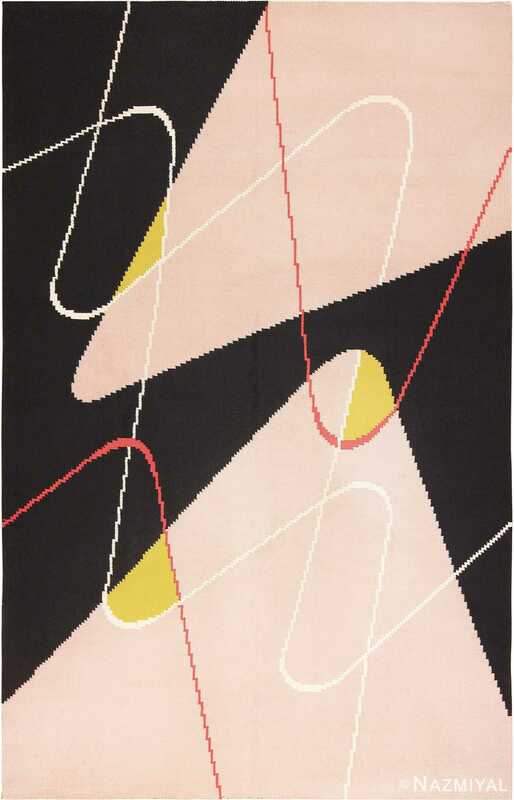 This sophisticated French art deco rug epitomizes early 20th century glamour with its strong, clear lines, luxurious textures and sumptuous wood-tone color palette.